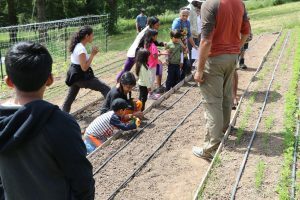 Nestled in the hills of Hillsboro, Oregon is the Edible Stories market garden, run by Ganesh and Lakshmi with some help from their daughter Anandhi, who volunteer with AID in Portland. 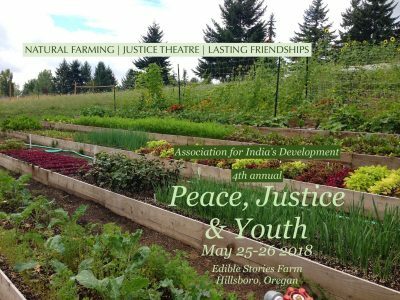 A living example of small-scale sustainable agriculture rooted in natural farming principles and local economy, the garden was a dream venue for the 4th annual Peace, Justice and You(th) conference. From its humble beginnings on the sidelines, the youth conference has become an eagerly anticipated feature of the annual AID gathering that makes kids as excited as parents to plan this annual weekend trip to reconnect and recommit to the causes of social and environmental justice. Could we make this dream come true? I asked Lakshmi, “Would it be okay for a group of kids and parents to descend upon the farm?” Hoping that our eager hands and skipping feet would not disrupt the rows of crops on which not not only Lakshmi and Ganesh but various restaurants and grocery stores in Portland depended, we sent out the call. Fortunately Ganesh and Lakshmi had us covered. They had identified some work that even the most untrained hands among us could do and feel proud of. And so it was that 30 kids, aged 3-15 gathered in the morning, enjoyed a tour of the garden including the greenhouse, hoop house, and hen house. The first stop was the germinator where Ganesh showed us the pots where seeds were staying warm until they sprouted and would need sunlight. Children sow seeds of various beans in the rows between the drip irrigation line that they helped lay at Edible Stories Garden. 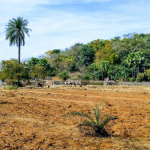 30 children of ages ranging from 3 to 14 got together, got their hands in the ground, planted seeds, transplanted saplings, helped to set up a drip irrigation line and got friendly with a hen … all before lunch time. After lunch the Theater Workshop began. A local artist and Drama teacher Tara Hershberger guided the children through theater games and exercises. before we knew it the kids had come up with characters and pieces of a plot. Theatre games like helped children articulate motives for their characters and thus develop both the character as well as the plot characters turned out to be related to farming. There was a farmer, the farmer’s children, the farm animals, the people who were trying to take away the farm, and those who were helping them in their corrupt and criminal deeds. I had wondered how Tara would be able to engage with such a wide age range of children in such a short time. Now I saw it before my eyes! The next morning, when she arrived at the conference, children were scattered around the venue and playing outside the building. Within minutes of her arrival they formed a circle and were ready for warm ups and rehearsal for the play that had taken shape just the day before. Following the performance keynote speaker Sumi Das handed out certificates to all the children who participated in the youth conference. Before calling it a day, the youth gathered round to meet Aruna Roy. Rather than talk to the children, she said that she would like to play a game, and asked the kids to make up a story, each adding a sentence and going around the circle. 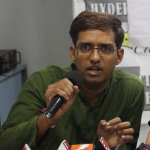 By the end of the story, Aruna ji picked up the thread and led into the story of a worker whose wages had not been paid and the campaign for the right to information which the Mazdoor Kisan Shakti Sanghatan started in the 1990s and which led to the Right to Information Act at the national level in 2005.